I know you're gonna give me hell for admitting this, but here goes. Growing up, I loved Swanson frozen TV dinners. The presentation alone was enticing to an 8-year-old me. The way each item fit into a perfectly-shaped compartment and included all of my faves was too good to be true. Down-home American choices like Salisbury steak, fried chicken or turkey and gravy with stuffing paired with mashed potatoes and a pat of butter, a brownie and who could forget the mixed veggies or bright green peas. I remember the way the mashed potatoes would get that crusty topping from the oven and the dessert would sometimes blend in with the veggies giving them a sweetness ... I'm getting hungry just thinking about a Swanson dinner. Before microwaves were popular, Mom actually had to pop the aluminum tray into the oven for about 45 minutes. Hubs once joked about how as a hungry child, he hated the long wait for his Swanson TV dinner. Our moms only let us have these dinners on special occasions. When I say special, I mean "Parent Teacher Nights" or nights when they had to work late and didn't have time to prepare food. Swanson sold 5,000 meals in the first year and over 10,000,000 TV dinners the next year! 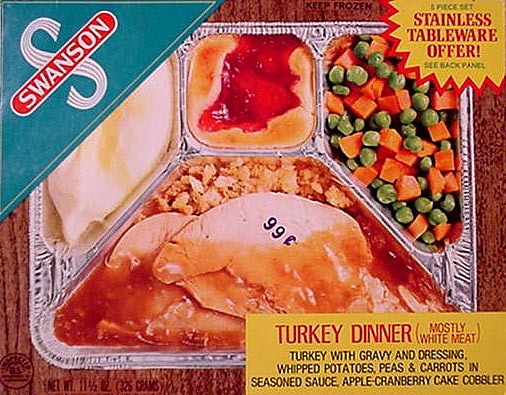 In 1987, Swanson replaced the tinfoil or aluminum trays with microwavable plastic. The original style tray can be found in the Smithsonian Institute! Check out this vintage Swanson Hungry Man Dinners commercial. I totally remember the song too, "Pull up a chair America, sit right there America, Swanson's cooking JUST for you!" U are really jarring my memory! LOL I remember those!. I use to love them as a kid.. It was considered a treat to eat one of those.. remember the fried chicken dinner? omg, now I think about the fat calories in that.. They still tasted good, but man they don't look anywhere near as appetizing as they do on the packaging. No hard time here, I loved them, too! Ah I do remember those! My mom cooked all meals. We only had these if she was going to be out of town. Thing I remembered was they never looked as good as the picture on the box! Actually I could go for a pot pie right now. Must be lunch time. We only had to eat these on nights like you but I didn't like them! Every time I come over here I read something that makes me smile. I remember that commercial!! And I used to love Swanson's dinners. I can't imagine how disgusting they would taste to me now though. No hard time from me, either! I used to love these when I was a kid! I still buy those chicken pot pies. YUMMY! So good. I LOVED Swanson TV dinners - my mom was a gourmet cook and a nutritionist, so they must just have made her heave, but we kids thought they were the greatest treat. And we'd actually get to use the little folding TV tray tables and watch TV while eating our dinners. It was so cool! whenever my parents were going out for the night and we had a sitter, she took us to the store and my brother and i got to pick which TV dinner we wanted to eat. we thought we were so cool! My favorite was the fried chicken, mashed potatoes and corn. Of course, the real (and only) reason why I got it was for the brownie. I loved TV Dinners, just not the same now because of the microwave. Oh yes, I grew up on these. Sad, but it was usually the closest thing to a square "meal" we got. My favorites, of course, were the ones with brownies. I loved how the brownies expanded to triple the size when microwaved. I love the TV dinners as a kid. We didn't get them very often, either. YOU'RE gonna give ME hell cuz I STILL like em. Take that! When I was a kid, I'd kill for one of the dessert brownies. Loved them! Ahh yes, there were many nights when I too was a Hungry Man. I believe "Parent Teacher" nights were one of the reasons...getting outta the house 'cause we were driving 'em crazy was the other. FYI...not a big fan of the brownie dessert. Never seemed to cook right. The compartments were such a draw for me. I can't stand when my food touches. But I stopped eating meat so young that I never actually tried these. It was a very special treat to get one of these when I was a kid! Mom didn't make these much for us. I only remember having the Salisbury Steak and Turkey ones which I liked except for the peas and carrots. Never thought about the high fat and sodium content back then. I did like some of the Lean Cuisine frozen meals but eventually the saltiness of them was unappetizing to me. I loved when my mom wasn't home, it meant I was allowed to have one of these, becuase it was one of the fel things my father could `cook` they were tasty! For a brief moment, my Mexican mom bought these for us and we cheered! Then, a few months later, they were gone. I wonder if the penguin made her mad. Not even. I used to love the chicken nugget Banquet TV dinners! Once I said something in front of some other moms in my grade about how "c'mon, mom hurry up. I need a TV dinner!" She was so not happy with me for blurting out that I ate those in front of everyone.